(L-R) are Mark, Marlin, Matt and Michael Pentz. Mark Pentz, president of Calvin Group Inc., remembers telling his father, "I'm gonna sell big iron when I grow up." His father would adamantly reply, "No, you're not. You are going to get a professional job." But that never stopped Pentz. After selling "big iron" for more than 30 years, he still has the same enthusiasm for the industry as when he was a kid. Growing up in central Pennsylvania, Pentz was in the business from a young age. His father, Marlin, ran a Blaw Knox, Case and Dynapac dealership. One of Mark's first jobs was sweeping floors there. "I was a kid sweeping floors and doing every mundane job you could do in a dealership, but I grew attached to the equipment," Pentz said. "Especially the road widener at that young age, probably because of its simple design." He tried the "professional route" just out of college, and he didn't enjoy it. That early passion for paving equipment never faded. It's a familiar story in the industry and that passion is still front and center. Just ask him. He loves the thrill of finding equipment and building new relationships. "There is just something about a road widener," he said with a grin. That's also one of the reasons Pentz gives when asked why his company sells only paving equipment. After a decade selling dirt equipment, Pentz returned to his roots and started his own company, Calvin Group Inc., in 1996 with a focus on used commercial paving equipment, like the road widener. The company has broadened its market from its early days in Ohio and Pennsylvania to a national and even global focus, serving customers in North America, Europe and Australia. 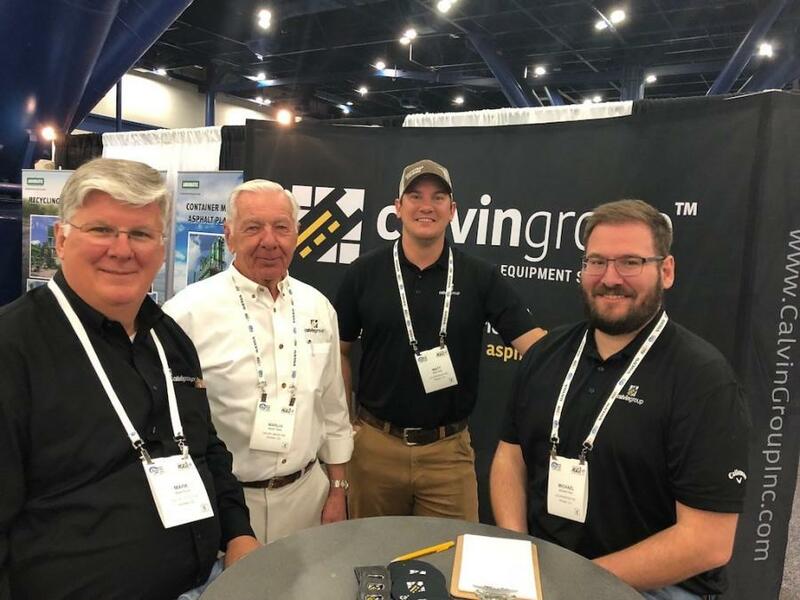 Today, contractors in the market for pavers, milling machines, road wideners, shuttle buggies, reclaimers, chip spreaders, distributors or stabilizers often look to Calvin Group for help, not only because of its inventory, but because of its business philosophy. "Our reputation is more important than selling a piece of equipment," Pentz said. "We've been very blessed to be able to have the relationships we do with our customers." So far that philosophy has worked out well for Calvin Group, and its reputation for honesty and integrity has spread internationally with the name Calvin Group synonymous with quality used commercial paving equipment. That philosophy permeates Pentz's family and the company, which his sons Michael and Matthew are both involved with full time. Michael, who is responsible for marketing and day-to-day details as well as sales, has been with the company more than a decade. Matthew more recently joined after working in sales at Ritchie Bros.
"We aren't here to compete with anyone else. We are here to augment everyone's business," Michael said. "We honestly don't look at other folks that sell paving equipment as competitors. We try to be an asset to everyone in the industry. Auction companies may call us for values, dealers call us to help with a piece that has been challenging to sell. Our goal is to do business with our customers and contacts for the long term. It's never just a one-shot deal for us. This is critical to who we are." To learn more about Calvin Group Inc., call Mark at 970/214-9888 or visit www.calvingroupinc.com.